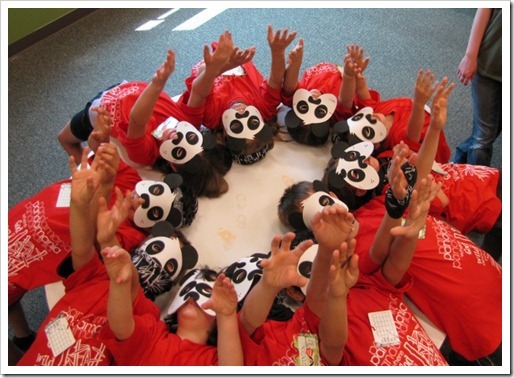 As you might have guessed, our theme this year has something to do with pandas. 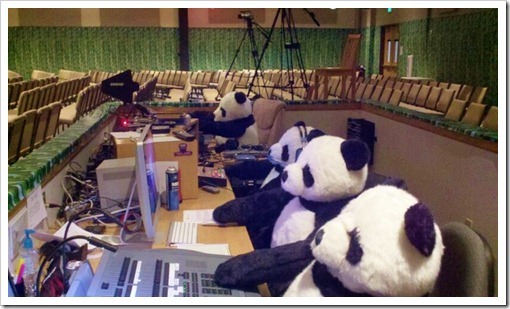 Specifically, our theme is PandaMania…Where God Is Wild About You! And, today was an incredible kick-off for a wild week. Here are a few must-see highlights from the day (more to come over the next few days). We love to worship. 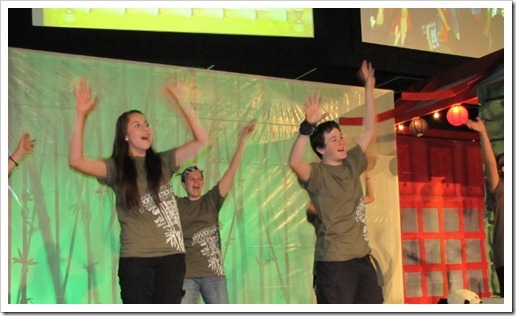 Of course, our worship is high-energy (great work-out), choreographed worship. Here are a few of our leaders showing us how it’s done. 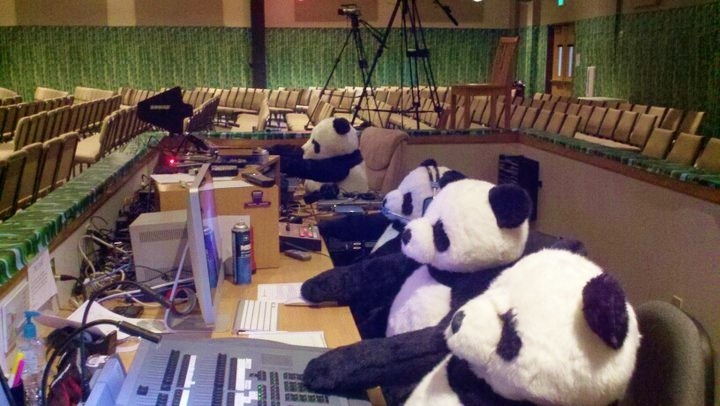 Here are some of our friends displaying their panda faces. It seems like every time I mention the word “games”, there is always a roar of excitement from the kids. Hmmm…I wonder why? Some would say it’s because the games involve outside and water. Well, today was not a disappointment. 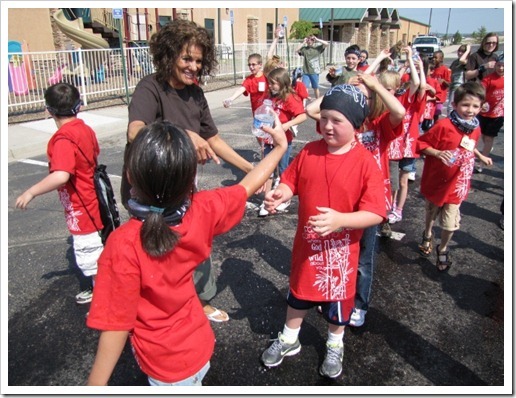 This game included passing water bottles over your head. The catch, though, is that the water bottles had holes in the bottom. 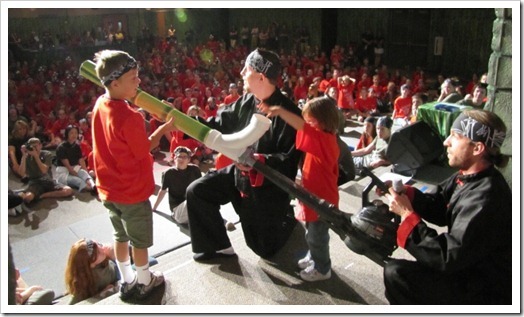 And we had some fun playing with our Panda Power Launcher! This crazy creation launched small stuffed pandas more than 50 feet through the air to find some of our friends and deliver a clue about God’s creation of the world. There was much more that we experienced. And, I will share more as we explore the rest of the week. We definitely like to have fun. And in that fun, we learn some incredible truths and promises. To put things succinctly, today, we learned that God Made You! Founded in the Creation Story written in the Book of Genesis, we learned that God created everything – the sun, moon, stars, water, land, plants, animals and even you and me. And because God created us, he knows us, he knows our name, and he will never forget us! How awesome is that?! We are here for a reason! God has a plan for us! God loves us! And God made us! Today was an amazing day. There were so many things that stand out to me. However, I will leave you with one thought… It is simply amazing to watch an ocean of children, teens and adults worshipping God. 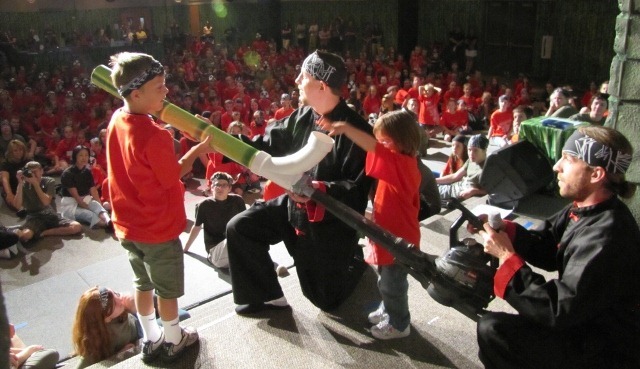 Question: Do you have a fond memory from Vacation Bible School or other children’s event – either as a child or as an adult? You can share your story by clicking here. Sounds like an awesome VBS! My church’s VBS starts in 3 weeks. I always love helping out with it though! 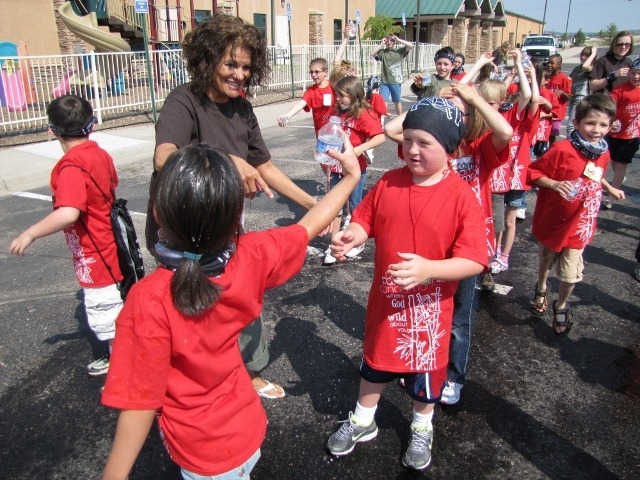 I started helping out with VBS a few years ago – now, I can’t imagine a summer without it! PS- From what I could see, your church looks very similar to my church! 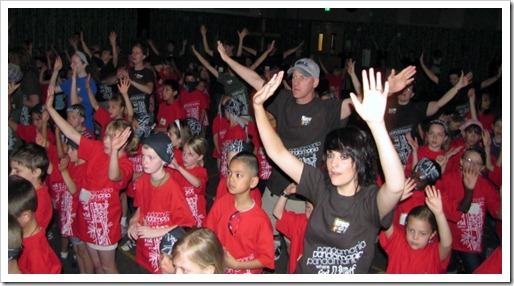 I grew up at a church where VBS was run as a very traditional summer church program. My one fond memory of this was the opportunity to serve as the mission’s director one year while I was in high school. This was a pretty big honor and privilege, and it was neat to lead kids towards thinking of others before themselves. 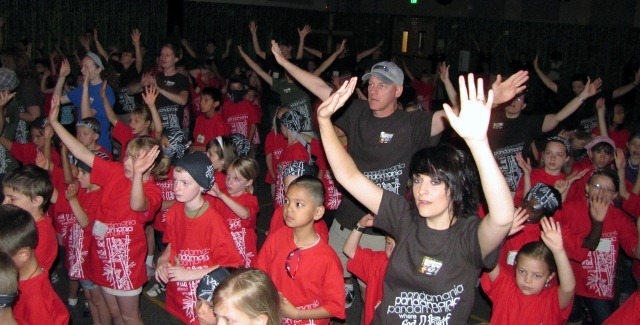 Now, I go to a church where our Kids Camp program is like VBS on steroids. At first, I didn’t get it. Why did it have to be so over the top. But the more I’ve hung around, I realize the power of this event. This is the single biggest evangelistic tool of our church. Easily over half of our church started coming to our church because they first sent their kids to our Kids Camp program. This year they are doing a Safari theme. 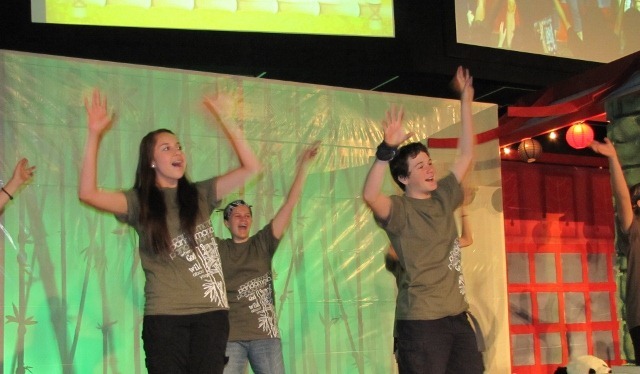 That is amazing – half of your church coming because of the Kids Camp program!! It really is true – if you reach the kids, you are likely to reach the families. VBS I meant to add. Hey Joe, thanks for stopping by to read the blog! 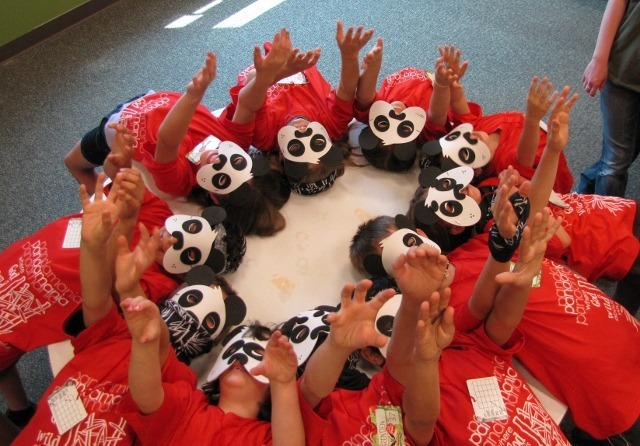 I hope your VBS is as much fun and has as big of an impact as what we are seeing!